It’s been a while since my last blog post. Since then, I’ve been to PASS Summit, which was the best one yet. I’ve presented at SQL Saturdays in Portland, Cleveland, and Iowa City. And, most excitingly, started a new job with BlueMetal. I am in the middle of week 3 and am really excited about the new challenge. I’ll be presenting on Using PowerShell to Automate Your Restore Strategy at SQL Saturday Columbus on July 16th. It will be my first time in Columbus, Ohio and I am looking forward to seeing old friends, making new ones, and teaching and learning. You can register and find more information at the link above. If you are in the area, don’t miss the opportunity to get a free day of training while networking with your peers in the SQL Server community. As I’ve mentioned before, I set a goal at the beginning of the year to average a presentation a month in 2014. My presentation, Designing a Recovery Strategy, at the Wisconsin SQL Server User Group this month put me halfway there. In June, I am presenting Designing a Recovery Strategy again at SQL Saturday #307 in Iowa City on the 7th. And then, for the first time ever, I will be presenting twice on the same day at SQL Saturday #286 in Louisville on the 21st. I’ll be doing Designing a Recovery Strategy and Interrogating the Transaction Log (now with 2014!) If you are close to either event, I highly recommend attending. It is a great opportunity to get a free day of training and meet other members of the SQL community. I close out the month by presenting Interrogating the Transaction Log at MADPASS June 25th. It has been a wild ride, but I’ve enjoyed every minute of it. Presenting is a great way to give back to the SQL community and I learn more than I thought possible every time I put a presentation together. SQL Saturday #291 took place this past Saturday at DeVry University in Addison, Illinois. It was my eighth SQL Saturday, and it was the first one I helped run. I want to thank Bill Lescher (t), Wendy Pastrick (b|t), Bob Pusateri (b|t), Jamie Samsel, and Andy Yun (b|t) for all of their hard work. I had a great time and have heard positive feedback from all of the attendees I’ve spoken with. The hard work these folks put in wouldn’t mean anything without the speakers who volunteer their time and pay their own way to attend these events. I especially want to thank Jim Dorame (b|t), Merrill Aldrich (b|t), Eric Boyd (b|t), and Grant Fritchey (b|t). With only 15 minutes’ notice, Jim stepped in to replace a speaker who did not arrive, moving from his scheduled noon slot to 9:15. Then Jim, Merrill, Eric, and Grant held a PowerShell panel in Jim’s original slot. Their willingness to take on extra responsibility epitomizes the SQL community for me, and went a long way to making the event such a success. Finally, I want to thank everyone who attended SQL Saturday #291. Without you, the SQL community would not exist. I spoke to a number of first-time attendees, and I hope they all come back again. The SQL community has given me more than I could ever give back. I’ve made great friends, learned from world-renowned experts, and grown personally and professionally. I met a current co-worker at SQL Saturday Chicago last year and my work in the community had a lot to do with my getting that job. If you attended SQL Saturday and got something out of it, consider giving back. Presenting, blogging, volunteering, and answering questions on forums are all great ways to give back. If you haven’t already, register for your local PASS user group. If you don’t have a local user group, consider starting one. 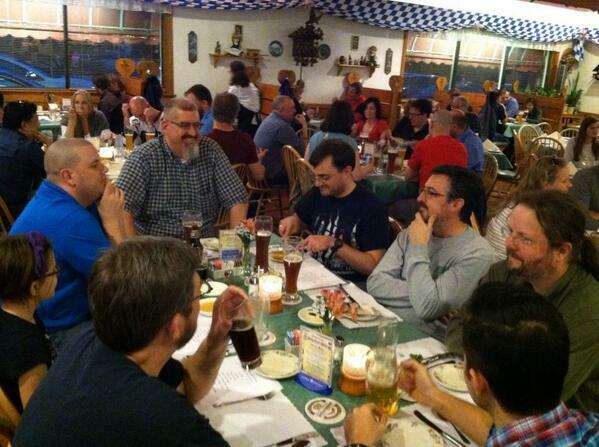 I’ve run the Chicago SQL Server User Group since July of 2012 and have had a blast. Feel free to contact me if you have any questions.